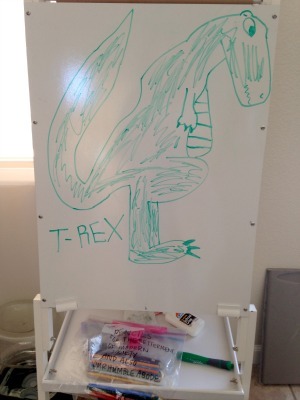 There are traces of them everywhere: the humming of the Wii left running, the smell of teen spirit wafting from my oldest's bedroom, the T-Rex frozen in time on the Whiteboard of Glorious Correction and Societal Alignment for the Advancement of the Revolution, whom I've named Fupa. Because shut up. The fact that I can't figure out what to do with myself when they're gone tells me that it's important they go. The fact that I have spent 12 straight hours in this same spot on my couch hyper-focused on work in the first day they're gone tells me that I need them to go. Minutes take hours and hours pass in the blink of an eye. I check my phone and my watch and my phone again for text and right at the moment I stop waiting for them the phone finally rings, and they are short-spoken and distracted on the other end of the line, somewhere on the road between this life with me and that one with their father. I am relived. They are perfectly happy. They don't need me the way I need them. They are going to be just fine. I have to get through six more days of this quiet, but I only have six days left of this quiet. I try to remember to save each extra fragment of time these elongated minutes give me, because it will be an even longer time before I hear this silence again. I close my eyes and try to conjure the things I like to do when I have any option in front of me. The smell of bath salts, the way the hair behind my ears clings to the cold of nighttime air, the taste of a cocktail at the audaciously early hour of 8pm. I break the silence, turn the TV on, and catch up on all the shows the show I like. I work and work and work and work and work and am grateful for the luxury of time to see something, anything from the beginning to the end, without once having to make the impossible choice between my children and anything else. I pass each of their rooms and whisper goodnight to them, just like I do every night and I imagine I will continue to do so long as I am able. I crawl into my bed and drown myself in the tiny sounds I can almost never hear - the creak of the house, the chirp of the crickets, the buzz of the streetlamps. I cherish this fleeting eternity without them, and in their absence I am reminded that my choice to be some small part of their lives has always, and will always, supersede my obligation. Maaaa-wwwm, my brother just threatened to kill me with my favorite snaaaa-aack.